With the Thanksgiving Season upon us, how appropriate it would be to highlight the famous dietary trio that was most assuredly, in one form or another, on the table of the first Thanksgiving feast, the Three Sisters, corn, beans and squash. The term Three Sisters is a commonly used analogy for the practice of companion planting these crops, where each supports the other; through providing structure, moisture retention or nutrient exchange. Both the nature and timing of the arrival of these cultigens into the Mid-Atlantic region continue to be intensively studied research topics in Archaeology, and the application of C-14 and AMS techniques have proved to be indispensable tools for dating these and a wide variety of other botanical remains. As the body of data continues to accumulate, it is evident that each of the “Sisters” arrived in the region at different times in history, with squash (Cucurbita pepo) being the earliest at between 5000 and 2500 years before present (Hart and Sidell 1997). Next in the sequence, corn or maize (Zea maize) becomes common in archaeological settings post-dating roughly 1200 B.P., or about A.D. 700 (Klein 2003). Finally, the common bean (Phaseolus vulgaris) is the last to appear in the archaeological record, at approximately A.D. 1300 (Hart and Scarry 1999). Native peoples in the area that would become Pennsylvania were raising all of the “Three Sisters” and enjoyed the nourishment they provided for hundreds of years prior to the settlement of Europeans in the New World. Today, we all are thankful for these staples of that first Thanksgiving feast and the many more that have followed. Additional Evidence for Early Curcurbit Use in the Northern Eastern Woodlands East of the Allegheny Front. Of Time and Three Rivers: Comments on Early and Middle Woodland Archaeology in Pennsylvania. In Foragers and Farmers of the Early and Middle Woodland Periods in Pennsylvania, edited by Paul A. Raber and Verna L. Cowin, pp. 117-129. Recent Research in Pennsylvania Archaeology, No.3, Pennsylvania Historical and Museum Commission, Harrisburg, PA. In the past, C-14 dating required large samples of organic material. New processes, such as accelerator mass spectrometry (AMS) allow for extremely small samples to be accurately dated such as seeds or the remains of a burned meal adhering to the inside of a clay cooking pot. For example, the plus or minus factor for the above date would be reduced to 40 years or less. A problem with C-14 dating is contamination of the samples – the addition of old or new carbon. A great deal of care must be used in collecting the samples. Further, charcoal is light in weight and can be moved around by wind and water. The same flood deposits that cover artifacts at a stratified site can bring in old charcoal eroded from a site upstream resulting in a C-14 date that does not accurately date the deposit. This type of contamination can be offset by getting many dates from a site. C-14 dates are relatively inexpensive (approximately $300 for standard dates and $600 for AMS dates) and presently it is a common practice, where the charcoal is available, to get over twenty dates from the same site. Archaeological analysis is a process of identifying patterns and C-14 dates are part of the patterning. If all of the artifacts and stratigraphy points to a date of 5000 B.P. and the C-14 date is 20,000 B.P., there is probably something wrong with the C-14 date. 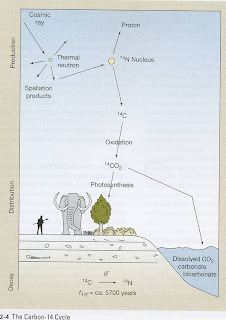 Changes in the intensity of the sun, the burning of fossil fuels and the testing of nuclear weapons has had an effect on the accuracy of carbon 14 dating. This has resulted in two problems. First, dates less than 300 years old are not very dependable and other methods must be used to date artifacts from this period. Second, it turns out that the amount of C-14 in the atmosphere has changed over time. This was discovered through dendrochronology – tree ring dating. Using AMS to date individual trees rings, it has been discovered that C-14 years do not exactly correlate with tree ring dates which we are sure relate to calendar years. For example, C-14 dates of around 3500 B.P. are several hundred years too old. On the other hand, C-14 dates of 11,000 B.P. are almost 2000 years too young. Formulas are being developed to convert radio carbon years into calendar years but the system still needs to be refined. In the meantime, archaeologists are using both systems - calendar years (cal yr B.P.) and radio carbon years (14C yr B.P.). This is probably going to be resolved in the next few years but in the mean time it’s confusing for both professional archaeologists and the general public. However, as one archaeologist, (David Hurst Thomas) has put it, “radiocarbon dating is the workhorse of archaeology”. It produces reasonably accurate dates, to within a few decades and it allows us to compare a variety of significant technological and cultural events. 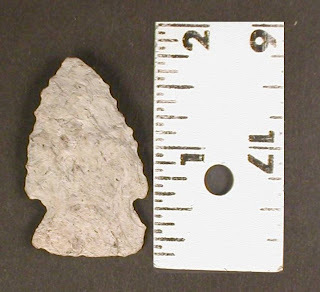 Projectile point excavated from the Central Builders site, Northumberland County. The above projectile point was excavated from a depth of nine feet below the ground surface along with a small group of stone tools and chips produced from the sharpening of tools. They were recovered next to a small cooking hearth with fire altered rock and charcoal. This point is similar to a style of spear point found throughout Virginia and North Carolina but it is slightly different. Based on its excavation depth, it is probably very old. Prior to the discovery of carbon 14 (C-14) dating by Willard Libby and J. R. Arnold in 1949, we would not know if this spear point was part of the same cultural tradition as similar spear points found below the Mason-Dixon Line or that this one represents a completely different culture. We could only guess at the age and its relationship to other regions or how fast projectile point styles changed. The discovery of C-14 dating enabled archaeologists to accurately date for the first time prehistoric archaeological materials in much of the world. It was a spectacular discovery and it revolutionized archaeology. With refinements to the method, especially over the past twenty years, we can now determine the age of objects in years before the present (B.P. ); we can accurately determine the age of significant events such as the beginning of agriculture or the entrance of humans into the New World; we can compare cultural sequences in widely separated regions of the world; and, most importantly for archaeology, we can measure the rates of cultural change. Carbon 14 is an isotope that is formed when rays from the sun bombard nitrogen molecules in our atmosphere. It acts like other elements such as oxygen or iron, but it is radioactive and therefore, unstable. It behaves just like the stable or non-radioactive form of carbon. All living things contain the stable form of carbon – carbon 12 and the unstable form of carbon – carbon 14. As long as plants and animals are alive, they absorb carbon 14 thereby introducing it into the cells of the body. However, when an organism dies, the input of C-14 ceases. At the same time, the stable form of carbon remains unchanged in the body. Because C-14 is unstable, over time it returns to a stable form of nitrogen. In 5,730 years, half of the original amount of carbon 14 in an organism will change back to nitrogen. This is called the carbon 14 half-life. Through Libby and Arnlod's discovery, the ratio of stable carbon to unstable carbon can be measured and a date can be calculated to determine the age of the carbon at the time of death. In essence this is how carbon dating works. A draw back with C-14 dating is that it can only be used on organic material such as wood, bone, or shell –materials that were once parts of plants and organisms. It cannot, unfortunately, be used to directly date stone spear points or pottery and these are, by far, the most common artifacts from prehistory that have survived the vestiges of time. Therefore, archaeologists must date the organic materials directly associated with these non-organic artifacts. Essentially, scientists date the charcoal from the cooking hearth or trash pit with which the artifacts are associated resulting in a proxy date for the non-organic artifact. The projectile point from the Central Builders site pictured above was associated with charcoal from the cooking hearth that radiocarbon dated to 9165 + 210 B.P. (University of Arizona Laboratory #10053). What does this mean? First, the University of Arizona facility performed the analysis and the sample number was 10053. The letters “B.P.” are an abbreviation for Before the Present. But that is not exactly correct because it actually means before the year 1950. Since the present is always changing, Libby and Arnold decided to use a standard date of 1950 (remember the discovery date of the carbon 14 method was year earlier) as the present. The date of the charcoal is 9165 years before 1950 but this is based on several measurements of the amount of carbon 14 and carbon 12 remaining in the sample. In the University of Arizona sample #10053, the number 9165 is the mean of a number of measurements made by the lab. This results in a plus or minus factor or standard deviation produced by the laboratory calculations. Therefore, using one standard deviation, there is a 68% chance that the actual date falls between 9375 and 8955 B.P. Usually, archaeologists are looking for a 95% probability and that means the date is somewhere between 9580 and 8745 B.P. This is a range of 835 years, but as we will see next week, this plus or minus factor has been greatly reduced by refining the radiocarbon dating method. 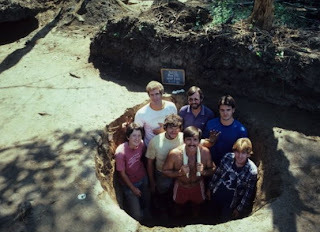 Fifty years after Donald Cadzow’s archaeological explorations at the Shenks Ferry Site (Cadzow 1936) staff from the State Museum of Pennsylvania returned to undertake further studies (Kent and Herbstitt 1986). Archaeologists and volunteers located Cadzow’s original excavations at Shenks Ferry, 36La2, and a section of the property was reopened. A complete house pattern and numerous pit features were found, including two deep silo-shaped pits of the Funk Phase period (ca 1400-1550 AD.). Among the contents of one pit, (Feature 132), were incised pottery sherds, chert and quartz debitage, a slab mortar, a few carbonized nut shells, charcoal and a unique clay effigy pipe fragment, all of which were likely cast into the pit along with the site’s refuse some 400-500 years ago. On the floor of the silo-shaped pit lay the pipe fragment, a well sculpted rendition of the head of an animal that resembles a wolf or perhaps another form of narrow snouted beast. Buff grayish brown in color, the pipe exhibits a darker brownish gray color around its neck that extends upward along the back of the pipe bowl, to the opening located between the ears and forehead. The modeling was completed during the unfired stage of manufacture since the relief appears well executed and smooth, with no indication of abrasion or gouging. 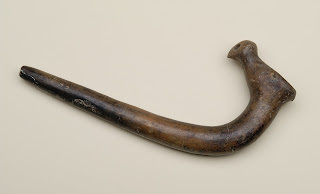 A similar clay effigy pipe of a bird recovered by Cadzow from the Susquehannock Strickler Site, 36LA3, dated to the 1645-1665 AD period, may be used for comparison relative to the shape of the pipe’s missing stem. It has been suggested that animal effigy pipes represent the owner’s clan affiliation within their native social group. (1936) Archaeological Studies of the Susquehannock Indians of Pennsylvania Safe Harbor Report No. 2. Pennsylvania Historical Commission, Harrisburg. Herbstritt, James T., Kent Barry C.
(1990) Shenks Ferry Revisited: A New Look at an Old Culture. Pennsylvania Heritage Vol. XVI No. 1, Harrisburg.